Yes – those folks just over the border in Scotland have been running a Bluegrass Festival now since 2009. Camping and a number of delightful local venues provide accommodation. In addition to that on their web site you will find a number of gigs often with an international flavour – these guys are doing a great job in promoting Bluegrass! Well now there is an instructional week end with the award winning Often Herd. Plenty of BBMA involvement here – one of our member bands – and event hosted by one of our members, and sponsorship for a number of students from our association. 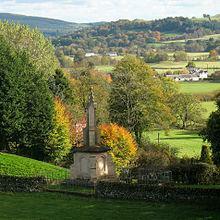 Just take a look at the beautiful countryside around the village – what’s not to like? Check out these concerts on the web site – its not that far from the North of England, and really worth supporting! Welcome to the Secretary’s Slot – what I hope will become a regular feature in the magazine, and hopefully our web site. My aim will be to try and keep you in touch with the latest news – and what your committee is planning. Please bear in mind the quality of my journalism is suspect, and I’m inclined to ramble (so I’ve been told!). So … lots of stuff going on, some of it only available on our web site I hope that most of it will be of interest to you – our members. Our finances have never been better! Much of this is due to the hard work of your Chair with his development of tour support. Our membership is also looking really good, your membership secretary has helped boost our numbers to around the 400 mark – we have at least 28 band memberships …. a reflection on the number of us who also play and sing! Sadly the proposed Summit on British Bluegrass has had to be put on hold – hopefully a temporary situation. We are also looking for help in terms of magazine production – our Chair is doing his best – producing an excellent magazine, but also has to contend with the pressure of several other jobs at the same time! On the good news front we now have a sub editor (Chris Couragen) who is based in the USA. Long term news is that we hope to up date the web site, to include some of our revised policies. The BBMA does offer a lot of opportunities – which we need to list as we publish the new conditions. So to give you an idea of what we are looking at, all of the following are available to our members. Sponsorship for students attending Bluegrass Courses – this one is currently under review, and we hope to have the new conditions posted on our web site soon. We loan money to Bands who want to record an album. We will provide start up grants for new venues. We will subsidise Bands to play at Festivals who don’t normally have any Bluegrass. Funding for anything Bluegrass … you can apply with the details and your committee will give it their full attention. Remember, if you don’t ask you don’t get! Our current Festival Discount scheme for members will run as usual for the next years festivals. In an effort to tell more people about us and what we do, the next AGM will also be open to non members. If you are a non member, but would like to raise an issue, then please use the contact button at the top of this post and let us know your views – the committee will be pleased to listen to what you have to say. Should there be votes taken at the meeting, then only members will be eligible to vote – please bring your membership card with you. The BBMA needs to reflect the needs of the Bluegrass community – so please come if you can, and help us to make that happen. So – also landed on my desk is a list of touring bands and musicians from the USA. Many of these are here with BBMA work permits, but not all! I can’t remember a time when there have been so many all at once! Several of us on your committee are also involved in promoting these bands at our local venues, and festivals. So in an effort to keep you informed …. I list below the gigs that have landed on my desk! The exact tour dates will be posted on the BBMA site. Please do confirm the gigs with the venues before you set off to travel – we do our best to be accurate, but I have been known to make mistakes! Nominations are open for the Jan Jerrold Award. This is the BBMA’s premier award for the person who has made the most significant recent contribution to the Bluegrass music scene in the UK. Your nominee doesn’t have to be a member of the BBMA but all nominators must be members so please include your membership number with your nomination. Nominations will close mid-April 2019 and the award will be presented at the BBMA AGM on 11th May 2019 (Orwell Bluegrass Festival). Who do you think has made a difference? Please send me their name and your reasons for nominating them. Please do it now, whilst you are thinking about it!